Today it’s my pleasure to introduce my art loving readers to a new multi-talented blogger on the block, MountainWoman Silver. I’ve known Silver since around 1994 when this attractive, silver haired woman walked up to me at a writer’s conference in Oak Ridge, Tennessee and asked if we’d met someplace before? As far as I knew, we hadn’t, yet she did have an air of familiarity about her. The next two years we spent a good deal of time exploring the Tennessee hills and valleys together as we discovered we had quite a great deal in common besides our love of writing. 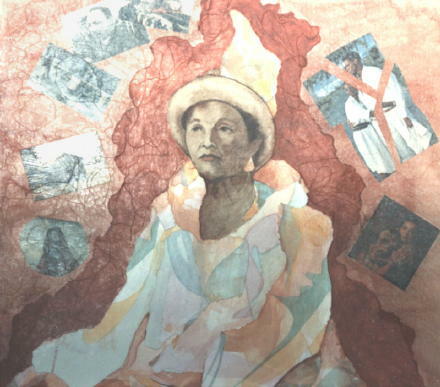 As we became better acquainted, I would learn of many other talents of hers that included all the arts I admired–photography, sculpture, painting in oils and acryllics, and fabric arts to name a few. She’s good at them all. When we were in Tennessee for that short period of about two years, she was heavily involved in exploring the fabric arts. 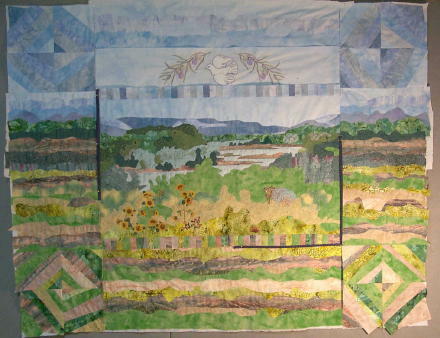 We went to quilt shows together, and she produced some traditional as well as art quilts during that period. She even convinced me I could do something like that. I really can’t, but she encouraged me to practice it for my own enjoyment. Here’s a couple of examples of her work that I especially enjoy. 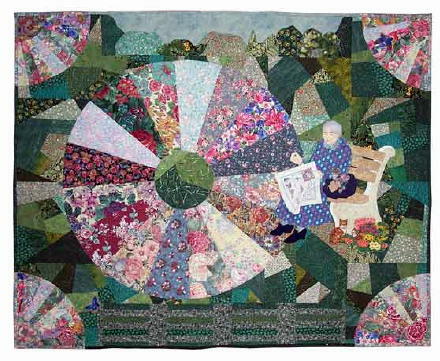 “Grandma in Her Garden” up there has become one of my favorite for obvious reasons. Here’s a detail of a commissioned art she did for a woman who had lost her young son in a tragic accident and wanted a quilt for her wall designed especially as a memorial tribute to him. The finished project is stunning, although out of respect for the owner (whom I could not contact for permission) I will not post the entire quilt. It’s possible you could see a photograph on the art web site where Silver’s art, fabric as well as painted canvas and other media, is listed. All these pictures will enlarge so you can see more detail, by the way, if you click on them. To go to the Art Site, click here. Here’s a quilt in progress. You can see the blocks have not yet been attached but the layout gives you an idea how the quilt came together in the traditional box layout. I have Silver to thank for getting me to think a little outside the box to try and encourage my own creativity. Sometimes things that aren’t perfectly matched or leaving a frayed edge makes a piece of fabric art much more appealing. I must tell you, it takes a certain “eye” that isn’t nearly as developed in me. I doubt you’d be surprised at all to know that Silver’s won awards and accolades for not only her fabric art, but some of the paintings she’s devoted her time to the past several years have been accepted into juried shows around the country and she’s now an award winning painter as well as fabric artist. Last but not least, “That Quiet Miss Emma” is one of her earlier collages I’ve always admired. I feel it represents all those other quiet little women who sit on the sideline and are easily dismissed into one stereotype or another because of how they look, their educational status, or myriad things that don’t truly define them. All the things that went into making Miss Emma don’t show on the outside except for those the artist chose to bring to our attention. If we take the time to know them, we’ll learn there’s a lot more to all the Miss Emmas of the world. Just before she moved away from Tennessee to a new state in the southwest, Silver was struggling with decisions to be made about how to dispose of a lot of things that seemed too burdensome to keep moving from place to place. So that quiet Miss Emma lives with me now. I know this is a busy busy time of year when there’s just not enough time to do all the things we need or would like to get done. 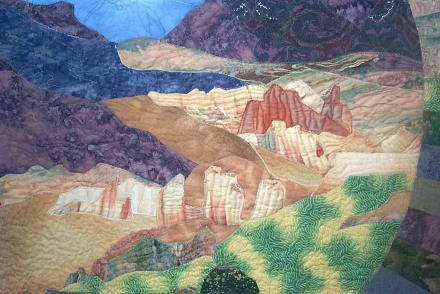 But I do hope you’ll take a few minutes to stop by Silver’s new blog, Mountain Woman Silver Speaks, where you can see more of her painting and quilt art. And while you’re there, I hope you’ll leave a little welcoming message. Oh and one thing she probably would NOT want you to mention . . . is how much I loved it when she used to sing the Milk Cow Blues to me, and how I was always begging her to sing it. So don’t mention that, okay? This entry was posted in Musings, Paradigm Shift, Personal, Yeah, but is it art? by Alice. Bookmark the permalink. Yup, I’ll click and see her work. Delightful. I’m looking forward to seeing how her work has grown and changed. Thank you. AND there are only three more days to Blogging Month. We are almost done. I give you your gold star in advance. 🙂 I’ve enjoyed every word. Thank you Mage. I’m giving you 2 gold stars. You deserve it. Congratulations to us all!!!! Thanks for introducing her to me! I visited; was impressed; and added her to my blogroll. So nice of you, Kay. I know you’d like her in person too. Very intricate work and interesting coloured landscape, it takes me back to my early visits to the cinema. Beautiful. Thanks for telling us about Silver. I’ll look next. Wow, what a great tribute! I really like her work and must learn more about her. From my heart, I thank you, Alice, for introducing me to your other friends. I have already visited the sites of a couple of them and am very impressed with their writing and photography. I hope to get more acquainted with them through time. I will put MyWintersSong in a tweet. Thanks again. The pleasure was all mine, Silver. I have some very nice blogger friends obviously!!!! silver’s singing is beautiful to me. i love to hear her voice. I absolutely agree. The two of us harmonized in a historic old church in Cades Cove in the Smoky Mts once. No accompaniment, just singing amazing grace and little church in the wildwood (if memory serves) and other visitors coincidentally walked in and sat down and applauded when we were finished. We’d hardly noticed them because we were so wrapped up in our singing. I wonder if Silver remembers that? Alice I do remember that adventure in the Smokeys, one of the nicest days I had in Tennessee. By the way, who is celecite? I’m wondering who else I sang with.